In this holiday story, the poor turkey remains on the run, even when he thinks he is finally safe. The farmer plans to cook him for Thanksgiving and when he sets out to get him, the turkey runs. He ends up using multiple methods around the farmyard to camouflage himself from the farmer, who ends up sparing his life for this feast. As the farmer’s family sits down to Thanksgiving dinner, the farmer is shown dreaming of a cooked turkey. The woman is staring at the empty turkey platter on the table, while the two children happily dine on grilled cheese sandwiches, peas and mashed potatoes. No turkey is served at this holiday feast, much to the disappointment of the adults in the story. 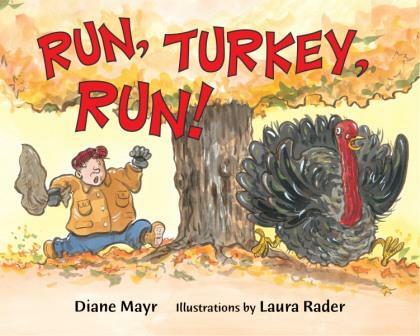 This is a fun book that gives kids a chance to root for the turkey as he continues running away from the farmer. Vegetarian parents and kids alike will appreciate the way the turkey outsmarts the farmer. It is important to note that the story takes place at an old-fashioned farm that depicts other animals, such as pigs, horses, and ducks. This story upsets my 3.5 year old. I think if it ended when the turkey got away after Thanksgiving, she’d like the story. When Christmas comes around and they find the turkey hiding in the Christmas trees, the story ends with us uncertain of the turkey’s fate, and this disturbs my daughter. She won’t let us read the book again after only one reading and keeps saying that they are going to eat the turkey. I remind her that the turkey got away and she says “But they found it!” It’s too bad because I think she liked the book otherwise.